XJTAG is fast becoming the preferred boundary scan solution of SMS Electronics, one of the UK’s largest electronic manufacturing services companies, due to its power, cost-effectiveness, portability and flexibility. Test has always been a strong area for SMS Electronics, based at Beeston, Nottingham, England. The company boasts a wide range of test solutions from flying probe, automated optical inspection, in-circuit test (ICT) and functional/full system testing. To speed up fault diagnosis on complex boards containing multiple ball grid array (BGA) devices, SMS has bolstered its extensive test capability by adding the XJTAG boundary scan development system. A major factor driving selection of XJTAG was the product’s inherent flexibility, which is important for a company with over 600 live products. As a part of the company’s commitment to design for test, SMS Electronics’ engineers work with customers early in the design cycle to ensure that boards are designed for test and manufacture from the outset. “We encourage our customers to use the XJTAG system as a debug and development tool and to populate their boards with JTAG components where available. This can significantly reduce product introduction timescales and lifecycle costs”, says Christopher Johns, test development manager at SMS Electronics. SMS Electronics assembles a high mix of complex products at low to medium volumes, typically 50 to 2000 boards. High speed and highly flexible production equipment allows around 12 to 18 daily set-up changes, with the capacity to place up to 4 million components per day. 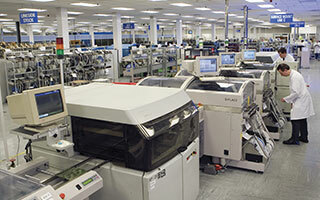 In addition to printed circuit board assembly, test engineering, system assembly and product lifecycle support the company offers comprehensive technical services including rapid prototyping, and design for manufacture and test. XJTAG is capable of testing JTAG and non-JTAG devices without requiring physical access. The graphical user interface displays the individual pins of components such as BGA and chip scale devices that cannot be tested by traditional methods. XJTAG enables circuit designers to cut the cost and shorten the development cycle and prototyping process and can migrate through the product life cycle from early design through to field support and repair. XJTAG also enables In-System Programming of FPGAs, CPLDs and Flash memories. The XJTAG system is a powerful and extremely cost-effective boundary scan solution which complements our wide range of test tools and can be used right from the beginning of the design process through prototyping and into production. This is very valuable and we encourage our customers to use the system as a debug and development tool and to populate their boards with JTAG components where available, as this can significantly reduce product introduction timescales and lifecycle costs. Boundary scan testing is increasingly likely to be included within the test strategy for emerging generations of electronic products as not only does it deliver a solution to the test access challenges that modern boards and components present, but it is also a powerful aid to rapid prototyping and intensive new product introductions.